Far away in 1930 in his empty room, the old professor was crying." And so was I! The current spate of World War 1 remembrances is hard on the emotions and one or twice I've been ashamed to find myself suffering something close to compassion fatigue. I approached Five Children on the Western Front with slight trepidation – was it just going to be a clever idea brought out at an opportune moment? I read it in the happiest of circumstances (lazing in the sunshine down a river on a boat) and was completely unprepared to find myself sobbing helplessly over the final pages. With my head I had guessed what would happen; in my heart I was overwhelmed. I opened that last chapter again just now to check the sequence of events and, dammit, I'm needing to wipe my eyes and blow my nose before I can carry on writing. How has Kate Saunders managed this? Her novel is far richer and deeper than Nesbit's and, for my taste, funnier as well. This isn't intended to be dismissive of the Founding Mother – Edith Nesbit has a stature and originality that the rest of us will only ever dream of – but rereading her Five Children and It did make me aware of the limitations of the string-of-adventures format. 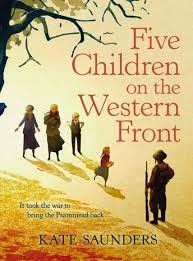 Five Children on the Western Front has several story-lines, a plot, a wider range of tones and characters and the scope to be part of something that is bigger than itself. It's certainly a book which hits that magic, inter-generational space where both adults and children can read with full engagement. Five Children on the Western Front belongs less to the children than to the Psammead. The sand-fairy is in trouble, deservedly so. “By the sound of it you behaved like an absolute cad,” says the Lamb. “My dear Lamb everyone kills a few slaves.” He is comic, he is nasty and can be seen as the prototype of all fallen emperors. There's a brief chapter where the action fast-forwards to 1938 and he's discovered chatting amiably with Kaiser Bill, with whom he feels much in common. When the Psammead arrives back in Nesbit's Kentish gravel pit in October 1914, just as Cyril, the oldest boy, is leaving for the war, he's been stripped of his powers. He's confused, vulnerable and furious “A stiff little boulder of crossness” as Saunders memorably describes him. He has been sent down to repent and it's lucky for him that Saunders has added a sixth child, nine-year-old Edie, to the original five. She's the only one who has time to stroke and care for him as her older brothers and sisters cope with the army, university, school and (for the older girls) their first attempts to challenge their parents' pre-war expectations. They are busy and are occasionally exasperated with Sammy's obdurate selfishness and his refusal to acknowledge his past crimes. Edie, however, sees “bewilderment in his eyes and lurking terror”. Her love is constant and undemanding and gives him his best chance to learn the lessons of the universe. What a wonderful and perceptive review of what sound a remarkable book! I'm sure this description will encourage even those readers who are feeling a little war-literature-fatigued. Terrified to read this book. Will the childhood memories of my Favourite Book of All Time be shattered? thanks for the heads-up. i'll be buying. and what a fabulous review! I couldn't agree more with this excellent review which persuaded me to buy the book. Five Children and It was one of my favourite reads as a child and I worried that it wouldn't stand a sequel. I needn't have done. Kate Saunders' book is an intelligent, moving, multi-layered work which is better in many ways than the original: an idea brilliantly executed and for me, already a classic. And I'm a 54 year old man still in bits having just reached the final pages. On the off chance that guardians endeavor to enable their kids to lose the weight, possibly by losing their abundance weight themselves, at that point they may well spare their kid's life.